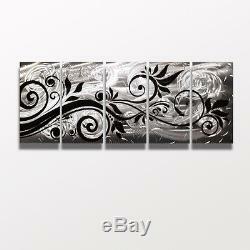 Hand Made Metal Wall Art by Artist Brian Jones - 68" x 24" x 2. 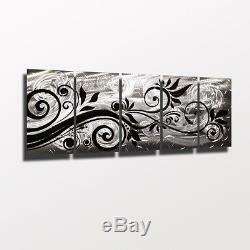 Beautiful hand crafted metal wall art - Made 100% in USA by metal artist Brian Jones. Get yours fast, this is a limited edition piece! Signature Series - Whispering Winds/ 2016. 68" x 24" x 2. Signed and Certified by the Artist. Ready to Hang, comes with wall template for very simple and perfect installation in minutes. Premium Aluminum Alloy Metal Plate. Track Lighting (LED or Halogen) 5200K - 6500K. What does "display size" refer to? Display size is the measurement of the artwork when it is on display - this includes all spaces in between and/or around separate panels. This is the minimum needed space to display the artwork. In general, bright but dimmable lighting is ideal. To get the effect pictured in our listings led track lighting (5200K) is used. We recommend a track type lighting system to optimize the display of your artwork, however this is optional and is truly a matter of preference. Natural daylight through a nearby window also looks great during the day! No- aluminum is one of the lightest metals available, and large pieces will only be 8-10lbs. What type of surface does the art have? The original metal surface is grinded, sanded, polished and sometimes even painted as well! Clearcoat may then applied to seal down components of the artwork. Hand made multi-media artwork will have a unique landscape of surface characteristics when finished! You will be receiving an original one of a kind work of art, no screen prints or copied prints of any kind! As stated above you will be receiving a hand made original work of art straight from the artist in the pictured design. We will often stock recently created work, however it also may be in process, or created new for you when ordered. Is the art original and not a print? Yes - All of our hand made artwork is created unique per piece, with it's own characteristics and individual nuances. Original Design Series are created by the artist on site with state of the art cnc tools in the studio. What if I want to return the art? Doing that is against U.
San Diego, CA Metal Artist. Educated at the Savannah College of Art & Design and has been creating work for over twenty years. Best known for his bold modern metal wall art designs, and more recently noted for the use of lighting in his work. In 2012 he pioneered the use of user controlled LED lighting in his art which has become extremely popular, and demand for his work has sky rocketed in recent years. Allthough you may see art made to look or operate similarly, Brians work is the real mccoy. Brian's work is featured in thousands of galleries, corporate installations, and private collections all across the US, and internationally in 34 Countries. Working directly with the artist allows us to offer amazing discounts and pricing you will simply will not find anywhere else. Each piece in our gallery is original and hand made. Only a limited edition of each design is offered. New designs are featured regularly. Often described as the "wow factor" our contemporary metal wall art is intended to bring a spectacular energy and ambiance into any living space! 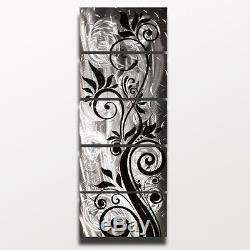 We sell 100% hand crafted metal wall art and sculptures direct from American artist Brian M Jones. All of our artwork is truly unique and original, you will not find our pieces for sale at any "big box" store! Since 2009, we have been proud to offer. Amazing value with direct-from-the-artist pricing! Courteous and Professional Customer Service. Accurate, and updated inventory - if you see it here, we have it! With thousands of satisfied customers, we have the experience meet the highest of expectations All pieces you view on our site are part of a limited edition series, and will be available for a limited time. Each piece is signed, dated, and delivered with certificate of authenticity by the artist. Thank you for visiting us! 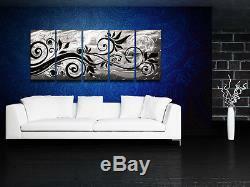 The item "Silver Metal Wall Art Large Contemporary Abstract Sculpture Painting Decor Jones" is in sale since Friday, February 15, 2013. This item is in the category "Art\Paintings". The seller is "dv8studio" and is located in Cincinnati, Ohio. This item can be shipped to United States, Canada, United Kingdom, Denmark, Romania, Slovakia, Bulgaria, Czech republic, Finland, Hungary, Latvia, Lithuania, Malta, Estonia, Australia, Greece, Portugal, Cyprus, Slovenia, Sweden, Belgium, France, Ireland, Netherlands, Poland, Spain, Italy, Germany, Austria, Mexico, New Zealand, Switzerland, Norway, Croatia, Bermuda, Guernsey, Gibraltar, Iceland, Jersey, Liechtenstein, Luxembourg, Monaco. 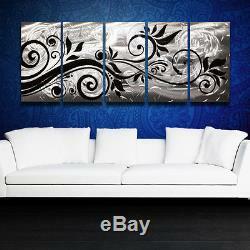 Size Type/Largest Dimension: Large 68"